Will Win10 1809 ever be declared “suitable for business”? Home › Forums › AskWoody blog › Will Win10 1809 ever be declared “suitable for business”? MrJimPhelps 3 weeks, 4 days ago. I am reminded of the NPR interview with the FAA guy this morning when he kept insisting that they are a “data driven” organization. Yea, I’m having to review all my WUforB settings and seeing if they still make sense for a time when I want it. I don’t think I’ve seen a single post by John Wilcox which makes any sense, but that one was three months ago. Windows continues to share the same servicing framework as Office, with a Targeted phase of deployments. This done with each windows release. There are only the 2 SAC releases. There never was separate SAC and SACT releases. Our guidance still has a Targeted phase, that is SACT. This is true for Office, the difference is in the update deployment update. With Windows, you get the image day one and manage your update roll out plan and schedules your self with SCCM, etc. With office, you subscribe to one of the 3 channels, but the framework and concepts are the same. He still won’t acknowledge that their proclaimed intention to “align” Windows and Office feature updates has failed. OK, my blood pressure just went down a few dozen points…. UPDATE: I suspect that everything posted with John Wilcox’s name on it is vetted (if not written) by MS Marketing. But MAN they have a hard time putting a sentence together. Is John Wilcox a real person or a marketing persona? Betty Crocker was never a real person but the pen name of whoever answered the letter back in the day (1920s). So it has been done before. which makes me wish Microsoft reduce the number of feature updates to 1 FU per year. My answer, Never. We will go directly to 1903.
doesnt that simply mean what he said in the post back in December? There is one windows release and it’s up to us, through WU or WUfB to control WHEN they get the updates? Basically there is “SAC-T” that we as a business should use for pilot, but it’s not a true targeted vs broad release. It’s just how WHEN we as the business determine it’s a broad release. sounds like MS has shifted the decision for business ready from themselves to us? Which they admitted was their fault for calling it “Current Branch for Business”. But Office still gets separate SAC-T and SAC releases (as well as an even faster Monthly channel). So they are now moving away from any “alignment” between Windows and Office updates. So what they should do is let users decide when they install a feature update. Microsoft has so many different versions under maintenance that it really doesn’t matter, they bring out updates for all those versions anyway. If someone wants the latest and greatest gimmicks: let him or her. If not, make this also a free choice. Get rid of those unclear delay settings. Just announce for example 3 months before a certain version is nearin end of support, so that users can install a newer version according to their wishes. In other words: give us back our own free choice. And dump those forced and useless frustrating ugrades. Which, when you think about it, is really just a continuation of the same “Wait for Service Pack 1” mantra we’ve seen since the Windows XP days. Don’t forget that 1809 is the basis for Server 2019 and the latest Windows 10 LTSC release. So, in other words, they have a version that can’t even be given the OK for general business use, but they still expect enterprises to deploy it, and they’re going to have to support it for ten years. Out of all the prominent tech companies in 2019, only Microsoft could find itself in this predicament. The mismanagement that must be going on behind the scenes in Redmond is astonishing. Microsoft has chosen to ignore the fact that businesses (and even just Home users) want a stable OS. They are attempting to induce users to test the deployment of chronically buggy upgrades right away, whereas many wise people were waiting for others to do the beta testing for them. It wasn’t just a matter of terminology effecting when businesses chose to update, but a matter of optimizing the stability of the operating system by the business. Remarkably, when recognizing the pattern and need, Microsoft doesn’t step up and make things more stable before release, but removes the announcement and terminology, throwing people into a constant guessing game of ‘Is It Ready Yet?. Microsoft is depending on businesses to adopt their recommended model for testing, which, especially for small business owners, is almost completely impractical and happening far too frequently, chewing up time and resources needed elsewhere. Eliminating the terminology doesn’t eliminate the dread that people face when updating can disrupt use of the computer… or stop them from trying to delay updating until other people identify and work through the bugs. A lot of businesses depended upon Microsoft alerting them to having a business ready, stable build… which newly released versions of W10 have never been. Just another example of how Microsoft is using our computers to meet their needs. That’s exactly why we – small company – left Windows and switched to Macs. The tiranny of unplannable updates and upgrades became too big and interfered with our workflow. At some point it was just enough, especially after some nasty bugs introduced by updates. I work part-time for a local credit union doing desktop support. We are in the process of deploying 1809 on all computers. (Currently most of them have 1709.) I’m doing a clean install of 1809, then reinstalling all of the customer’s apps. * One of our servers is really old, and it uses SMB v.1. 1809 disables that by default. So prior to putting a computer on the domain, I have to enable SMB v.1 support. We use another really old program, MICR Quick. Because it is really old, I have always installed it in Compatibility Mode with XP SP3 rules. I’ve never had a single problem with MICR Quick. I lock down a few things in Group Policy, such as delaying Windows updates and blocking preview updates, as well as turning off sleep and hibernate. In my opinion, when a new version of Windows seems to break something, it is probably just a case of Microsoft tightening up on some rule or practice that they allowed in the past, but that it would improve things in some way if they tightened up on it, such as disabling SMB v.1 by default. So basically it’s NOT so great with 1809. User software should keep running, even if it’s old. Especially if it did work on former versions of Windows 10. If it doesn’t, the OS changed so much that it requires a new version number and compatibility mode for 10. The name ‘10’ became a marketing gimmick, technically speaking so much vital stuff changed in the last years that now we’re basically talking about Windows 14 or so. In matter of system management it’s a total mess. I lost counting how many Windows 10 versions are under active support by Microsoft at the moment, but it must be a monstreous job to keep track of it all. If that’s even possible. To me, it feels like a continuous betatest. I prefer a solid OS without stupid extra’s as transparent windows and other useless makeup. If I would want that, I should just be able to simply add a module for that. As it looks now, Windows internally is such a chaotic mess of old and new stuff wired together, that basic features can only be updated by re-installing (aka upgrading) the whole OS. With all risks that are related to that. The alternative is doing a clean install, as you do. But in my opinion it’s ridiculous that that is required. In that matter Windows lives still back in the ninetees. Maybe large companies can afford an army of system managers and expensive support, but most smaller companies can’t. Home users not at all. The irritation is growing and the running gags about updating are numerous. Indeed 10 will be the final version of Windows because it’s running on its last legs. Probably it’ll survive as an OS for home users in the xBox, the non-gamers are switching to other devices. Windows systems are probably still in use by large numbers, but what I see people doing with it is not much anymore. Only advantage for many people is that a laptop or pc has a decent keyboard, so it’s used for typing and such things. Gaming on a pc is beloved by a certain group of fans, but for the masses rather useless and above all expensive. Buy a game console or a good tablet or smartphone and you’ll find fanastic games for them too. Will be interesting to see when semi annual targeted channels with 365 day delay will get a forced upgrade this time. It might be totally unexpected at a very incovenient time 🙁 Because no one knows when the clock for the set delay is gonna start ticking. Leaving aside the problematic 1089 for a moment: I have heard people on the sysadmin side of Windows to say, repeatedly, that Windows 10 is just fine, very good, stable, etc. I have absolutely no reason to doubt their sincerity or that they do not know what they are talking about. I honestly wonder if the reason for the discrepancy in what they say and what others here are saying is that those are people who love their jobs of taking care of lots of computers and are happiest updating their OS several times a year, the more, the merrier, because that is their call. IMO, it’s our modern culture of constant complaining. Constant access to social media, plus constant presence of a smartphone in one’s hands, plus no real repercussions….. equals a lot of c****y yap. There’s also an increasing wave of anti-intellectualism in the English-speaking world, where actual expertise is rejected in favour of people (almost always a narcissist) who speak loudly and angrily. We’re seeing it in flat-earthery, global warming, misogyny, vaccination, cars, sports…… why wouldn’t we see the same anti-intellectualism in perceptions about Windows, too? Not to say Windows doesn’t have a ton of problems, it sure does, but there’s a massive difference between saying “I don’t like Powershell because it’s a lot more verbose than the POSIX toolchain and I prefer brevity”, and “Windows sux lol use Linux”. I do have some theories on why many people choose to be angry rather than smart, but it’d be firmly off-topic for this board. The thing is that in large companies Win 10 is managable. Because of for example running own update servers. Having ready made images for workstations in case something goes wrong. Problems can be solved remotely from the site of the IT-department. In short: those IT-people are used to solving problems 24/7 and are also used to get stuff up and running quickly. Also keep in mind there is a very strict split in data storage and software storage. Often, a Windows workstation nowadays is nothing more or less then some kind of terminal on steroids. Smaller companies and individuals get hit much harder if something goes wrong. They also have much less (or in case of home users none at all) control over installing updates and upgrades. And it’s at those moments that most problems appear. It’s a whole different ballgame if a small company fights a full work day with restoring images (if they made them in the first place), or get confronted with an upgrade they basically really don’t want. Often, it takes time to readjust software, even worse is software that worked fine in a former version and stops working after the upgrade. Driver updates etc. etc. Such things are extremely frustrating because they simply cost too much time and money. Last but not least: keep in mind that Microsoft pets the large companies and multinationals with all kinds of help, trainimg etc. etc. Also Win 10 Enterprise is much less risky because of a very low upgrade frequency. Concluding you can say that those people you talk to are probably right. For them it IS managable. For common people lower on the ladder, it’s much more risky. It actually also shows the future for Windows: it’s mainly targeted for larger companies and institutions, much less so for smaller settings. That’s also not where the money is, after all. I would add government organizations ( both civil and military) to the list. Never going to happen. The few machines running 1809 will upgrade to 1903 in a hurry. Then 1809 will be an abandoned platform. The way I see it, 1809 is so bad that comparing it to even Windows ME or Vista is a night and day difference. I am no longer an active member of the forums. that depends if the hardware (and its drivers) are current enough. I have 1809 on every computer I own .. so about 10 computers. No issues. 1809 is going to be around for 10 years, in both Windows Server 2019 and Windows 10 LTSC forms. It’s going to be fine. If you are not using Windows Update for Business today, “Semi-Annual Channel (Targeted)” (SAC-T) has no impact on your devices (more information can be found here), and we recommend you begin deployment of each Semi-Annual Channel release right away to devices selected for early adoption and ramp up to full deployment at your discretion. This will enable you to gain access to new features, experiences, and integrated security as soon as possible. If you are using Windows Update for Business today, refer to the table below to understand when your device will be updated, based on which deferral period you have configured, SAC -T or SAC. There is only one release date for each SAC. For devices connected to the update service, using WuFB, we begin updating them based on the values the users have configured their devices. We don’t have separate release dates, consumer vs other. For commercial customers that self manage, they get the same release, but determine when and how it will get published to their users via their management tool of choice, SCCM, home grown or other. I am hoping that Wilcox is incorrect, but it’s looking more like MS just horribly announced that they no longer are giving an official “ready for business” date anymore. There is work underway to evolve the Windows Update for Business model, and have deferrals based on just one offset date. Once that happens, the SAC-T entry on the release information page will go away and you will just see two entries per year. This change will be communicated well in advance. We have now completed that work. Beginning with Windows 10, version 1903 (the next feature update for Windows 10), the Windows 10 release information page will no longer list SAC-T information for version 1903 and future feature updates. Instead, you will find a single entry for each new SAC release. In addition, if you are using Windows Update for Business, you will see new UI and behavior to reflect that there is only one release date for each SAC release. That was really announced by Wilcox nearly a year ago: There is work underway to evolve the Windows Update for Business model, and have deferrals based on just one offset date. Once that happens, the SAC-T entry on the release information page will go away and you will just see two entries per year. This change will be communicated well in advance. The key difference is that he is stated it starts with 1903, however, the links I posted all revolve around 1809. Furthermore, I am not talking about deferring updates through WU or WUfB, but rather the “Ready for Business/CBfB/SAC/X” nomenclature that my company and so many more use to determine that it’s “safe for business use”. 1) Businesses have been using MS’s “SAC” release dates as an indicator of when to move to the next release, example. That no longer appears to be communicated, starting with 1809. Let me cast this in concrete terms. I have my 1803 Windows Update advanced options set to the “Semi-Annual Channel” release channel with 120 days deferral. When will I get 1809? The key difference is that he is stated it starts with 1903, however, the links I posted all revolve around 1809. Your first quote indicates that 1809 should get an SAC date in my opinion. Furthermore, I am not talking about deferring updates through WU or WUfB, but rather the “Ready for Business/CBfB/SAC/X” nomenclature that my company and so many more use to determine that it’s “safe for business use”. They’re very closely related, because you can’t defer without a start date for each channel. He specifically said starting with 1903, and that’s not contradicted anywhere. I suppose there is where the confusion lies, at least with me. My understanding of all the various information linked in this thread is that there are 2 SACs per year (Spring/Fall), and that MS isn’t designating a “ready for business”/broad release anymore. You either self manage (upgrade whenever), or currently, you defer, and starting with 1903, you pause. Basically what i’m getting at is, it seems there isn’t going to be an announcement of, “1809 is ready for business, because it again, at least me seems that MS already considers it broadly released as of Nov 13th. March 13 might have applied if there was only going to be one date. But my guesstimate would be July 30. Interesting that we’re still trying to figure out the implications of Windows 10’s last release, when the next is due about now, despite Microsoft’s attempts to explain how things should work. Probably means it’s a good job they’re now using artificial intelligence to manage update deployments. Well put, both of you. I just wish somebody would explain this in plain English. I’d even settle for Japanese. It will never be ready. MS makes it’s products be more confusing and out of alignment with everything that came before. I don’t find any of this confusing. It figures. + The deferral period for 1809 begins, (for a maximum of 365 days) from that point. + If they release 1903, with the changes they have made to SAC doing away with SACT, the deferral period for 1903 begins, (for a maximum of 365 days) from that point. Now they have two versions of Win10 reaching the end of the deferral time simultaneously. What would you do in that situation? Now THAT’s a combination I didn’t consider. Could happen. If it does… who knows? Within a couple of months. Does it really matter what’s declared? It seems to me that what really matters is whether it works. I used Win 10 v1809 (updated to February’s patch level) hard all this week doing engineering development work on a modern, high end Dell workstation. I have the Group Policy set to download but not install updates. It notified me once this week that there were updates available and asked whether I wanted to install them. I did not. No fuss. I crunched through terabytes of data. I did not hit even one problem. I didn’t think about the OS; I focused on my tasks. Is Win 10 more bloated than it needs to be? Sure. Does it do more useful stuff than its predecessors? Not that much. Does it need tweaking to be useful. Absolutely. But these things are manageable. I still remember Windows XP and Vista losing data and blue-screening (and yes, I had good, reliable hardware back then too). Windows 7 not so much, nor since. From my perspective, this version is quite suitable for business. It is not ready for business and it will never be. Windows Xp will live on forever. It is the best OS and last one that MS made. I have not noticed your usual benchmark post, but how many minutes of time was consumed for taming 1809(1901)? Because I did it on a new system in a new (to me) office environment I didn’t track it as well as I often do, but having on hand a VM in which I’ve already made the tweaks, as well as a reference guide I’ve built up over time, as well as some scripts to help, made it not take an inordinate amount of time. I got it in the ballpark in about 3 days. One of the reasons I have kept up with what’s needed to make a current Win 10 setup into a serious workhorse is that I anticipated needing to do so on hardware sooner or later. This was the time of that need. Benchmarks to compare this new hardware system with my prior efforts in virtual machines would not be that useful. However, I do have benchmarks that compare my 6 year old Dell Precision T5500 (Win 8.1, dual Xeon, SSD array) with this new Precision 7820 (Win 10, single Xeon, NVMe array) seem to imply that Win 10’s bloat is soaking up at least some of the additional performance the new system could potentially offer. These, for example, were done on Passmark PerformanceTest 8.0, which is the tool I have benchmarked my current workstation on for its entire life. Red is my older workstation, blue is the newer one. 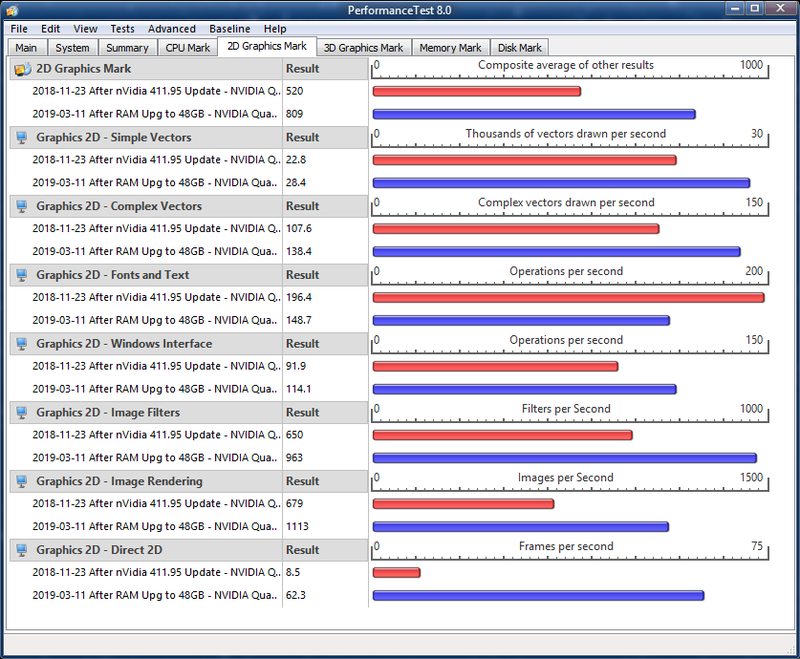 Of particular note are the RAM and graphics tests. 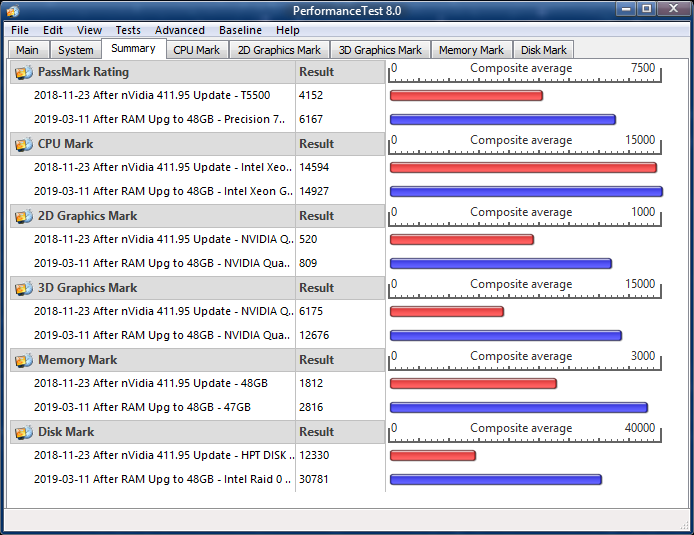 I fully expected all the readings except CPU to more than double my older system’s performance measurements. Despite the hardware being overall about twice as powerful, there several categories where the new system actually runs the same tests more slowly than the older system, and there is one – an important one, Fonts and Text rendering – that matters for the user desktop experience. So basically it’s NOT so great with 1809. User software should keep running, even if it’s old. Especially if it did work on former versions of Windows 10. If it doesn’t, the OS changed so much that it requires a new version number and compatibility mode for 10. I disagree that it’s not so great with 1809. As for supporting older software that ran on former versions of Windows, Compatibility Mode does exactly that — it allows users to run ancient software on a modern version of Windows. And it usually works, although sometimes you have some software that is so old, even Compatibility Mode doesn’t work. For those rare cases, you can run a virtual machine with as old a version of Windows that you want. In other words, Microsoft has provided ways to run all ancient software with any version of Windows, while at the same time keeping Windows moving forward with the latest technology. The name ‘10’ became a marketing gimmick, technically speaking so much vital stuff changed in the last years that now we’re basically talking about Windows 14 or so. In matter of system management it’s a total mess. I lost counting how many Windows 10 versions are under active support by Microsoft at the moment, but it must be a monstreous job to keep track of it all. If that’s even possible. To me, it feels like a continuous betatest. I prefer a solid OS without stupid extra’s as transparent windows and other useless makeup. If I would want that, I should just be able to simply add a module for that. I used to think the same thing about Windows 10, until I was forced to actually use it and support it. I found that with a tweak here and there, it is an excellent OS, very solid if you have a modern computer. (I wouldn’t risk running it on an old computer.) I know that this has not been everyone’s experience, but it has been my experience. Thanks for presenting your own experience as evidence that Windows 10 is not some useless monstrosity. My main concern about it, all along, has been the fast “upgrade” cadence. Even if no big changes happen from one version to the next, these are changes to the OS, not to some applications running on it, and I have always found changing OS, even if only from one version to the next, troublesome to some extent. Being an user without the expert backing of some organization sysadmins to take care of most issues related to the transition and that have probably done it already several times for others before me, I find that it slows me down and even stops me from doing what I actually have to do, until I learn by myself to navigate the ways and cope with the quirks of the new system. More so, if it happens on an annual basis and one also has to “upgrade” at such a pace without first waiting a while for the system to have its worse original problems fixed, while one could do that as little as once every three years, if one chose to do so, with macOS. Or at even longer intervals with Linux. * You can lock down updates so that they are delayed – this will give Microsoft time to fix a problematic update before it is installed on your computer. * You can block preview updates. * You can define when a needed reboot can occur, so that it doesn’t occur during your normal working hours. These options can be set in Group Policy. Also, if you have older software, you can install it using Compatibility Mode, so that the software will run using the rules of a previous version of Windows. Compatibility Mode is a must, in my opinion, if you have any must-have older software that you cannot easily update to a newer version. Performing these steps will eliminate most if not all of the problems associated with Windows 10 updates. Reply To: Will Win10 1809 ever be declared “suitable for business”? EP on What happened to the second monthly “C Week” cumulative updates? PKCano on windows updating after Susan says it is safe!!!! taftbaby on windows updating after Susan says it is safe!!!! CADesertRat on Is free Win 10 Upgrade still working? Rick Corbett on How did Microsoft sneaked a driver ?